Finish Guard™ Containment and Barrier Protection Film ASFR 6 sheeting is a 6mil thick Anti-Static and Fire and Flame-Retardant polyethylene sheet film. 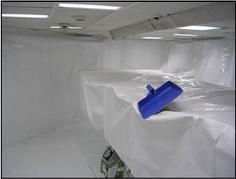 It can be used either as a curtain-type barrier or a temporary protective covering. It can be hung vertically as a drape, mechanically fastened or taped in to place. 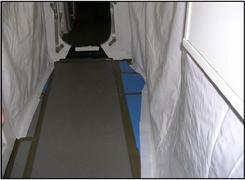 It is used where flammable polyethylene sheet film is not allowed. 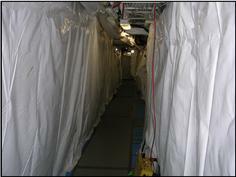 - As a replacement for flammable polyethylene and other sheet material used in containments, etc. 12' x 100' x 6 mils thick - 42 lbs. 20' x 100' x 6 mils thick - 70 lbs.